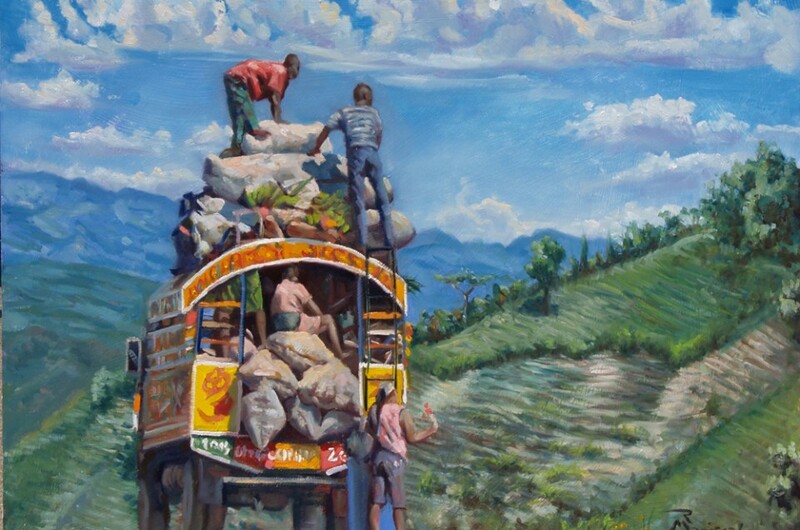 Renown Charleston artist, Robert Maniscalco, has created an exhibition of paintings, expressing hope and renewal from a Vision Trip to Haiti in 2014, in collaboration with Water Missions International. For more information please email Robert or contact him by phone at 843-486-3161. 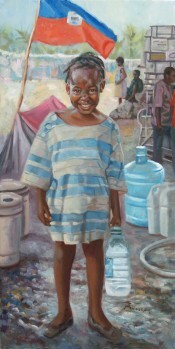 Renown Charleston artist, Robert Maniscalco, best known for his distinctive commission portrait work, has created a series of paintings, called “The Quench Project” from his recent vision trip to Haiti (November 2014). He is nearing the release of his book, Quench and short film, Out of the Darkness. Robert explores alternatives to societal ideas about beauty, tragedy and survival. His theme is the resilient nature of humans to rise “out of the darkness.” Robert, who is a survivor of child sexual abuse, has dedicated his artistic life to helping others in their creative journey of survival. Robert received Kickstarter support last August for The Quench Project and is using the money to mount a touring exhibition of these paintings, in a variety of venues in several states, where people can come see the work in person and be part of the conversation. If you know a venue that may want to feature the Quench Project, contact Robert. The City Gallery at the North Charleston Coliseum December 3-31, opening reception December 3, 5-7pm. In the tradition of the Social Realist movement, the project’s goal is to raise awareness for societal issues in Haiti and other places. Water shortages, economic inequality and racism are part of his focus. He has created a body of 14 paintings. A portion of sales from the paintings, reproductions and book will be donated to Water Missions International and to the Bread of Life Orphanage in Jacmel, Haiti. Robert went on a Vision Trip to Haiti which lasted 10 days as part of the Water Missions International (“WMI”) team. In Haiti, Robert assisted in the WMI missionary work to process and bring fresh water to areas still devastated by the earthquake and water shortages. Robert’s food and lodging while in Haiti were provided by WMI. There he took over 1,800 photos, made sketches, interviewed Haitians who are finding creative ways to thrive under difficult conditions. While in “lock down” at the WMI headquarters in Port-a-Prince he painted an 11′ replica of DaVinci’s Last Supper. 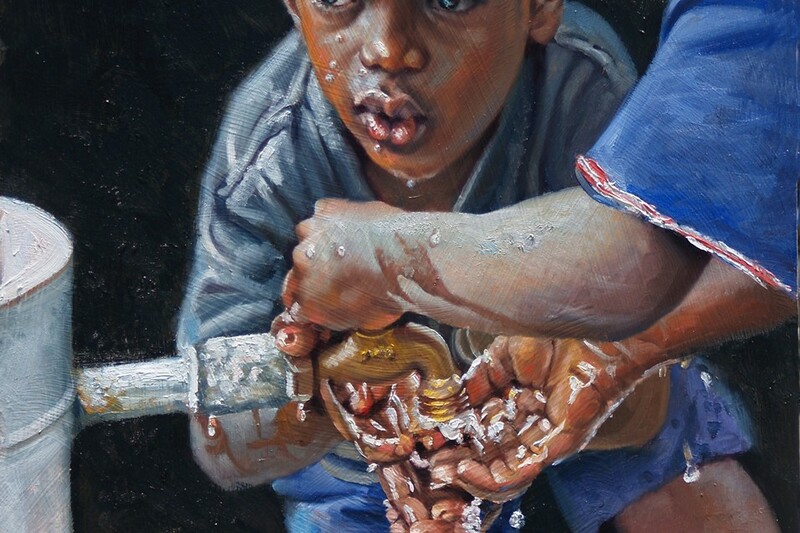 From his written and photographic reference he has created an exhibition of 14 paintings for a traveling exhibition called “The Quench Project,” focusing on the impact of WMI’s living water message and world-wide relief efforts. The exhibition is a call to action for the continued need and awareness for his sponsoring organization, WMI, a Christian-based non-profit organization, who have invented a unique water purification system, dedicated to bringing fresh water to remote areas around the world. Visit http://www.watermissions.org/ for more info on their powerful mission. The primary intention of the The Quench Project is to raise awareness of WMI’s mission and generate funding for their continued mission there. A portion of the proceeds from the sale of work will go to WMI in the form of another donated work for their permanent collection. “Christelle,” created in 2012 (right), is the prototype for The Quench Project, and is part of their collection. A larger goal for the project will be to raise awareness of the world water crisis related to a growing population, a disparity of wealth and the effects of global warming. WMI will also provide an exhibition and launch event in their facility for special invited guests. 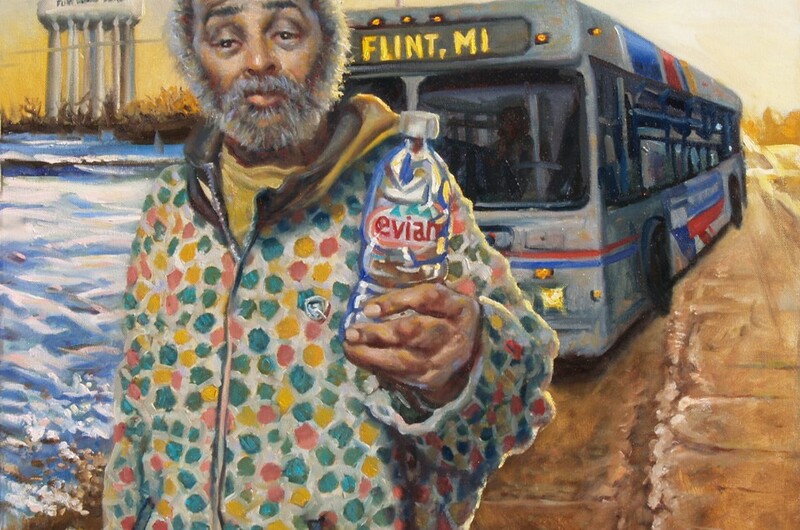 A full color book, Quench, is almost ready for publication and will feature reproductions of the paintings, photographic images, along with the story and insight related to the Quench Project paintings, along with his personal responses and impressions of the experience, inspired by the WMI vision. All Kickstarter contributors will be receiving an inscribed copy of the catalog. 50% of all profits from the project will be going to WMI or the Bread of Life Orphanage, which was one of the focal points of Robert’s vision trip. Me too, always has. Ever since I became renowned I have bemoaned that I am renown. If I am renown does that mean people are getting to know me again?